There has been a lot of social unrest lately — Ferguson, Baltimore, etc. — and most of the unrest seems to tie back to socioeconomic status and opportunities for advancement within society, among other things. Awareness has been raised about the seemingly limited paths to prosperity. But, what can I do about it? The truth is I probably cannot make much of a difference on a policy-making nor systemic level. I’m not an elected official and I don’t have the ear of many high ranking state or federal legislators. I also don’t have millions, or even thousands, of dollars that I can barter with in terms of campaign contributions. However, I don’t think change has to start in the halls of Congress. It can start in your own home or school, and then spread to other communities once progress has been shown. Recently, I was watching Vice’s new series called The Business of Life. In episode 1 they mentioned that it takes people until 30 years of age to earn the median wage in America, which according Georgetown University is $28,031/year. There were also people talking about student debt, and the failings of many people to find gainful employment after earning a 4-year degree. Wow! I could never afford my lifestyle earning $28,000/year. Imagine if I had to pay to student loans, and tried to afford my current lifestyle on $28,000/year. I wonder how many people actually look into earning potential for their careers before pursing that degree/career path. While thinking about these things, I began to do research. I found data from the Bureau of Labor Statistics on the average wages earned in Minnesota (my current residence) based on profession, and the number of jobs available for each given title. I found the data fascinating. You should check it out for your state, or any place you plan on moving to. In high school and college I may have been assigned the worst guidance counselors and career services workers. But I tend to think, based on talking to other friends, that my experience is the norm. Attend the job/career fair. Get an internship, they say. Nothing specific, nothing measurable, nothing exclusive, nothing gained. This is a big opportunity to build from the ground up. Career services workers, and guidance counselors, should be informing kids about the cost to pursue an education, as well as the potential earning power and job availability for their potential paths. It would allow kids and their parents to better understand the costs (and opportunity costs) of education, where to pursue that education (in state vs. out of state), and how likely they would be to find a job after college in a given state. Let’s take a look at the data for Minnesota. I’ve sorted it by annual mean wage. As you’ll see, I have circled two titles from the list: Marketing Manager and Sales Manager. I circled those titles for two main reasons. Earning power. 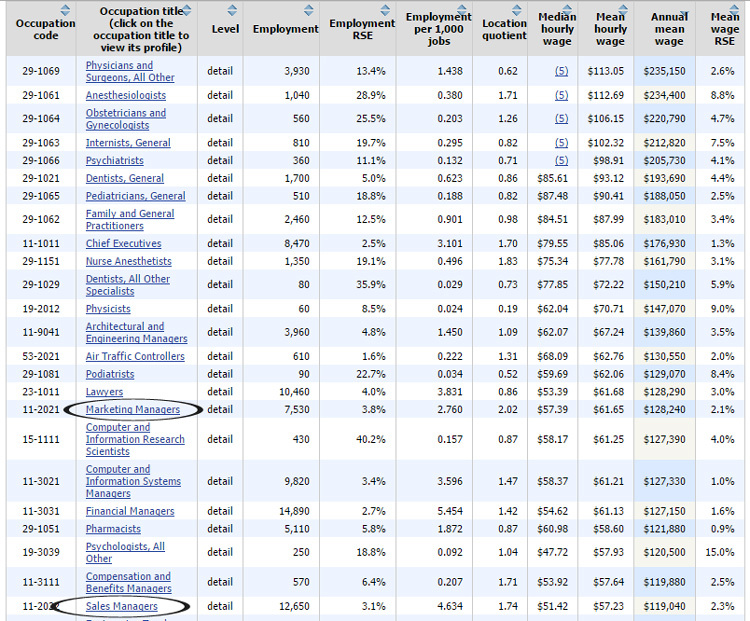 Both titles are listed in the top 25 of annual mean wages across all titles in the list. The cost of acquiring that type of position. While becoming a Surgeon, Physicist, or Lawyer takes intelligence, it also takes a lot of expensive years in higher education systems and, thus, years out of the workforce. Meanwhile, the path to becoming a sales manager or marketing manager takes much less time spent in higher education and more time spent in the workforce. Plus, there are more job opportunities. It’s a shorter and less expensive path to prosperity, and a comfortable life. I didn’t have the luxury of parents who understood the University system. We were blind as to how to make things work in our favor throughout the college process. Luckily, I had already learned the value of hard work, making lasting friendships, and the art of putting together deals from my parents and on my own. But, I don’t think many people have that support system. When that’s the case, the system (eg. career services, guidance counselors, teachers, etc.) needs to provide resources for everyday people to gain actionable data that can help them make more informed education decisions. There are still paths to success in America, but it’s important to make sure the race you’re running is worth winning.